Chop parsley, capers and garlic until fine. Zest lemon, add juice and stir in with olives, if using. Whisk in oil, adding it in a slow trickle. Meanwhile, steam asparagus preferably in bamboo until al dente, check after 5 minutes. 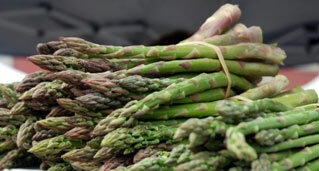 Place asparagus on plate or platter, drizzle with green sauce using about 1/2 tablespoon per 3 oz. cooked asparagus. Garnish with caper berry sliced in half.